Rina Baker and Bonnie Burke urging people to vote on term limits. Rina Baker and Bonnie Burke are long-time Grand Rapids residents unhappy that the same old policies and politics seem to dominate their city government. So, last March, in 12-degree temperatures, they went door-to-door asking residents to sign a petition to place a term limits proposal on the November ballot. The initiative would limit the mayor and city commissioners to only allow a person to serve two four-year terms in office. The response was overwhelming. Within months, they had recruited 45 people to circulate petitions. 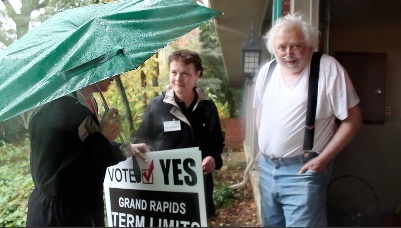 They called their group the “Grand Rapids Citizens for Municipal Term Limits” and by summer had collected 10,000 signatures, some 3,400 more than needed. Baker and Burke say they're glad the proposal got on the ballot this year, a year in which voters are choosing a governor. Local turnout for gubernatorial elections is several times higher than it is for mayor and city commission. But they're not finished yet. Recently, the two women have dodged bad weather, dogs and on one morning a dead mouse while going door-to-door asking residents to support the measure at the polls and place “vote yes for term limits” signs in front of their houses. According to the Michigan Municipal League, 27 municipalities in the state have term limits for local elected officials. With the exception of Chicago, nine out of the 10 largest cities in the U.S have term limits. In 1992, Michigan voters approved term limits for state lawmakers by an 18-point margin. Baker and Burke say they have gotten support from all groups: progressive, conservative, minority, young and old. The Grand Rapids City Commission is made up of the mayor and six commissioners. All are part time and are non-partisan. By 2017, five of the panel of seven would have served at least two terms. A published report from city attorney Catherine Mish questioned whether the proposal would apply to those already in office. She did not respond to a request for comment. Opponents of term limits say voters can already kick politicians out of office on Election Day. But Baker and Burke note that few people vote in municipal elections. Turnout for the last election in 2013 was 14 percent. Four groups have publicly opposed the effort: the local Chamber of Commerce, the local AFL-CIO, the Grand Rapids Press and a group calling itself “Protect Your Vote,” led by local political science professor, Glenn Barkan. Burke is not surprised by the groups fighting term limits and offers a reason why she thinks they are. “I think they have time to develop relationships with the people in power once they are familiar," she said. "Lobbyists and special interests become friends with politicians and naturally have a voice where the common man doesn’t necessarily have that access." Baker ran unsuccessfully for city comptroller and city commissioner, but denies her push for term limits is sour grapes. Opponents have conducted a mass mailing of post cards in which the phrase “term limits” is noticeably absent. Instead the card urges voters to “protect your vote” and not to “change the local charter.” The group did not respond to a request for comment. "This grassroots campaign for term limits in Grand Rapids shows just how citizens can take back their government from the insiders and special interests. They'll be outspent by those powerful special interests, but voters very much want the new blood and new ideas that term limits bring." According to the most recent study by the U.S. Term Limits Foundation, nationwide, 58 million people live in municipalities with term limits for local elected officials.